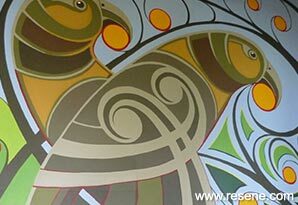 Originally the clients saw a painting of Peter Edmond’s kaka (a native bird found on Great Barrier Island) and they had the vision of Peter creating a large mural for them to go under their house as a feature artwork for people to view as they came up a walkway from a nearby beach. Peter Edmonds is a wood artist and painter who has been resident on Great Barrier Island for 38 years and is a fulltime artist. He often creates work with his wife, Fenella Christian, who is also an artist. This is the biggest work he has completed to date though he has work in collections both in New Zealand and overseas. 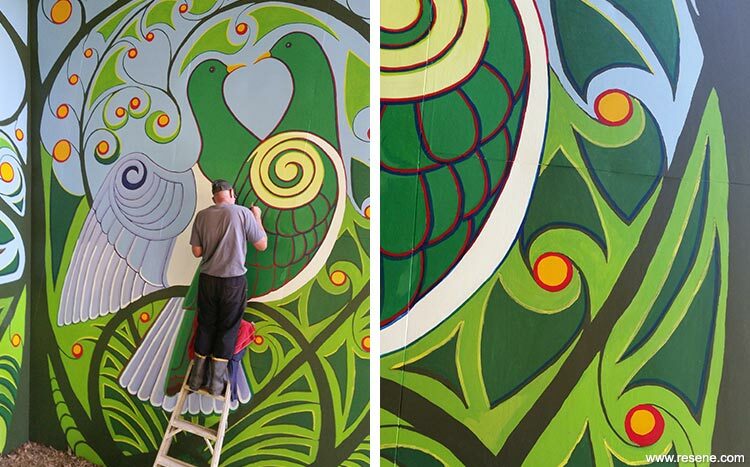 The mural started off as a series of drawings that were emailed to the clients who live overseas. The plan was to create a 40 square metre mural on two slanting walls underneath a large architecturally designed house in the bush at Tryphena on Great Barrier Island. 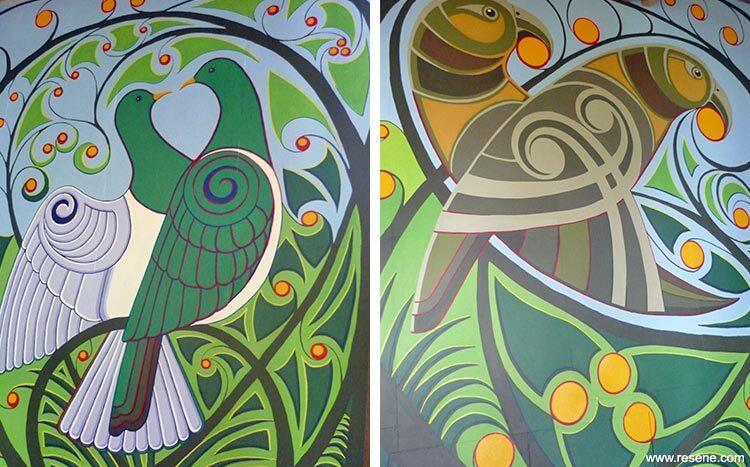 The design is of two kakas and two native pigeons that tower above you as you walk up the walkway. Great Barrier Island has an abundance of fruiting native trees and is a stronghold of kaka and pigeon, and all of these were to be brought to life with the palette of Resene colours. Opposite was planned an installation made of copper, and the two artworks were to complement each other. 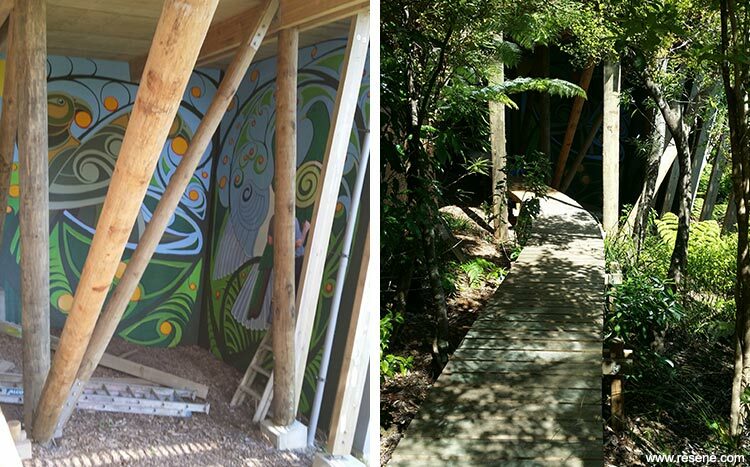 The mural colours needed to connect the artworks together and also blend in with the bush and sky in the background. From the pencil drawing, the design developed as it was drawn onto the walls. The challenge was working out how to get the drawing onto the large scale of the walls and getting the perspective right with the slanting walls. It is the scale of the mural that is breathtaking. It towers above you as you stand on the walkway. Resene colours were chosen for their colour fastness, finish and the range of colours available. With such a huge range of colours, there was plenty of scope to put a considerable amount of detail with colour into the mural. The palette included Resene Orchid White, Resene Mission Brown, Resene Atlantis, Resene Happy, Resene Double Resolution Blue, Resene Bokara Grey, Resene Hashtag, Resene Poppy, Resene Campground, Resene Seaweed, Resene Ninja and Resene Double Alabaster. Scaffolding had to be built to reach the high places and the wall had to be divided into quadrants to transfer the design onto the walls. Ladders were used to help reach some of the more difficult places and it was a matter of manoeuvring around the different heights to transfer the design that was challenging. Paints were kept on the path while the painting was underway, which worked well until walkway users suddenly appeared out of nowhere! The mural is under the house and reasonably protected from the weather but there were days when it rained all day and days when the wind howled through under the house.